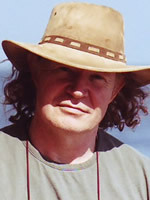 Bill Ryan is a British - Canadian UFO researcher. He is the former webmaster of the SERPO site, as well as the former Webmaster and co-founder of Project Camelot which wants to offer whistleblowers a platform to "dare to speak." Co-Founder of Project Avalon. From the Project Camelot web site: Bill Ryan has a BSc in Mathematics with Physics and Psychology (Bristol University, UK, 1974), and followed this with a brief stint in teaching. For the last 27 years he has been a management consultant, specializing in personal and team development, leadership training and executive coaching. Major long-term clients have included BAe (Systems) Ltd (formerly British Aerospace), Hewlett-Packard, and Price Waterhouse Coopers. In November 2005 he inaugurated the Project Serpo website, the report of an alleged disclosure, in stages, ofa US-alien exchange program claimed to have taken place over 40 years ago. While he had been interested in UFOs, Free Energy research and alternative medicine (he is trained as a kinesiologist) for over thirty years, his first contact with the UFO community at large occurred after establishing the Serpo website. Sources: Project Camelot web site and the Exopolitics Institute.